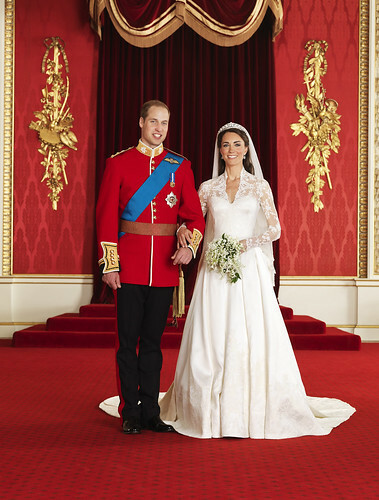 It's official, the bells of Westminster Abbey are ringing loud as Prince William and Kate Middleton are now married and a Royal Couple. The couple have signed the Register in the shrine of Edward the Confessor, stealing a well deserved private moment for themselves. And, Kate was seen asking Prince William in the Royal Carriage if he was happy, to which he acknowledged that he was. You can see by the exchanges they give each other that they are deeply in love. The ceremony was majestic, a modern day fairy tale and now the newlyweds are on their way to Buckingham Palace where everybody around the world is anticipating the long awaited kiss on the balcony. Prince William now becomes His Royal Highness The Duke of Cambridge and Kate Middleton becomes Her Royal Highness The Duchess of Cambridge. The new coat of arms for The Royal Couple will be an amalgamation of both of their current Coats of Arms below.